and decided to get a start on the Houses of Hawk Run Hollow. It's a change from working with only one color, and with these Au Ver A Soie silks its a pleasure! Here's a quick picture of the start. I'm beginning with house #4. 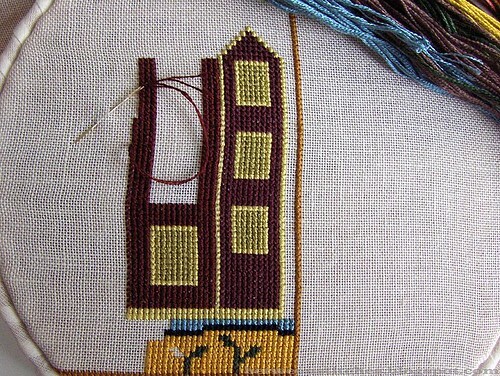 You'd think it was an easy pattern, the houses are pretty much square, a nice change of pace from the more fiddly bits of the Quaker and sampler pieces I've been working on, but no. Counting long rows of stitches once, twice, maybe three times takes time, and doesn't guarantee it's right! After a few false starts, I've finally gotten it right and have found a rhythm. At least I'm doing something again. Life has been busy and I've been de-cluttering again, which has taken up much of my time, leaving little to quilt or cross stitch. Adding to that, Blogger has been very unkind, frustrating my access to my own blog and to leave comments on others! Today after a few attempts I was finally able to post today. On a happier note, I picked up some goodies a few days ago, and can't wait to share them with you as soon as I have better lighting (it's dark and misty today). Also, a new little quilt is finally in the works - I'll be cutting the fabric today I hope and share that with you as soon as possible. On this Tuesday, Election Day, I bid you happy stitching! Great job! Hope the blog thingy is all worked out. Take care. Great start! Aren't AVAS silks just the best? Love this! I know what you mean about finding less time to sit and do stitching or quilting. I am so busy with things going on with remodeling our house that I find little time. Yesterday was a rare day indeed when I had a paintbrush instead of a needle in hand. I should not paint and was in too much joint pain to stitch in the evening. Oh well...at least my wall looks nice. :) I do hope to spend a little time today on some stitching and perhaps start thinking about sandwiching my Bethlehem Star quilt.